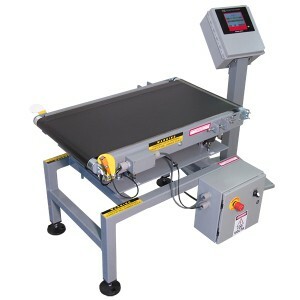 Designed for case and small bag weighing applications, the Intermediate offers belt style conveyors from 26” long to 36” long, and belt widths of 12” and 18”. Conveyors are powered by a 1.9” dia. 24VDC powered motorized drive roller with variable speed controls. A single 89 to 230VAC 50/60 Hz. source power connection is all that’s required. Medium size bags, boxes, cartons, jugs. Produce, bagged goods, logistics, order fulfillment, chemical, pesticides, food products, available in wash-down for ice cream, dairy and bakery applications. Rates as high as 60 packages per minute. Accuracies as high as +/-9g (0.02 lbs.) @ 2 Sigma. Variety of capacities from 10 lbs. to 60 lbs.